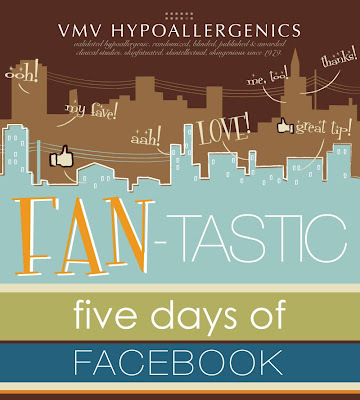 Join VMV Hypoallergenics' "Fantastic Five Days of Facebook"! Just "like" VMV Hypoallergenics Facebook page and participate in their 5 day activity to get a chance to win VMV goodies such as a VMVanity Kit & lipsticks. This is your chance to score discounts as well! Once a fan of VMV Hypoallergenics Facebook page, you get alerts on their latest product launches, get to be in on the latest skin secrets, take part in skinteractions with fellow VMV lovers and of course, get direct access to the folks at VMV! "Fantastic Five Days of Facebook" will run from March 14 - 18, 2011. "Like" the VMV Hypoallergenics Facebook page now!